The idea of making coastal voyages in company, in open boats powered by sail and oar, was given currency by the French group Albacore, led by Charles-Henri le Moing during the 1990s, starting in Portugal and Scotland. Called ‘Raids’ in French (e.g. google ‘raid velo’), the word has slipped into English and lost its usual associations of pillage and destruction – to those who participate at least. 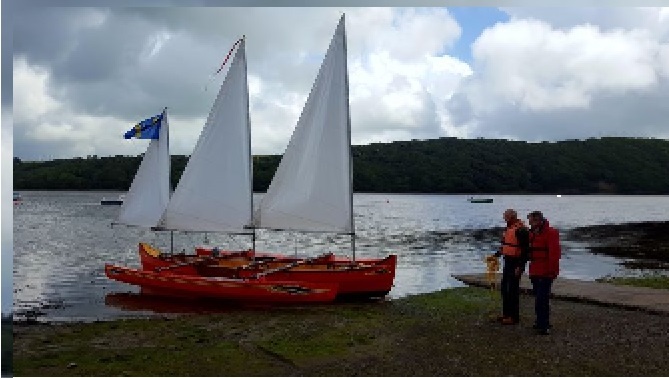 The objective is to encourage recreational coastal voyaging in attractive locations using only sail and oar, to encourage the use of traditional boats which are well-suited to the objective, and the development of new boats which are able to carry on the sail-and-oar tradition. A successful fleet will gather 20-40 boats of a wide range of designs and abilities, from a number of European countries, from 10 feet to 30 in length, largely gaff or lug-rigged, some better at sailing, some at rowing, but all capable of making progress at both. Memorable raids have now been held in the Douro River in Portugal, the Great Glen of Scotland, the Blekinge/Karlskrona archipelago of Sweden, Finland, the Venice lagoon and the canals and lakes of Holland (the Dorestad Raid), The Solent, the East Coast, the Norfolk Broads, Falmouth, Plymouth and the Clyde. Much larger events at Morbihan, Douarnenez and Milford Haven have characteristics of raids, and involve entertainment and sponsorship on a scale the ordinary raider can only dream about.